Instantly estimate how much it will cost to replace your hot water heater. To get an accurate quote select your: Water Heater Type (storage vs. tankless); Fuel Source (gas vs. electric), Tank Size, and Warranty Period. Calculate Water Heater Costs Now! Note, the data for our water heater cost estimates is regularly updated. 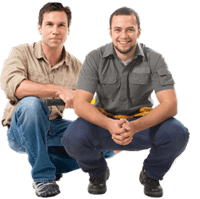 It is sourced from 100's of professional plumbers throughout the US. This means your price will be very close to the actual estimates you will get from a local contractor. When Is It Time To Get A New Water Heater? The short answer is that if your hot water heater tank started to leak, and it cannot be repaired, it is time to replace it. We strongly recommend NOT to delay replacing a leaking water heater, because if the leak becomes more severe, it can flood your basement, and in worst case scenarios cause personal injuries. You will end up spending a lot more to fix this extensive water damage, compared to the cost of speedy replacement, when you just noticed the problem. Watch the video below to learn if its time to retire your old hot water heater. Moreover, if your valves are leaking - you may not have to replace the tank! Most likely, all you need to do is replace a leaking valve (typically a Pressure Relief Valve). If the tank itself rusted and is leaking, it is beyond repair. In general, a hot water tank lasts 8-12 years. Electric hot water heaters last longer than gas ones, and can have a service life of up to 15 years. A tankless hot water heater will last significantly longer: 18-20 years! So based on service life expectancy of your particular water heater, you may want to replace it BEFORE it starts giving you trouble. Usually its a good idea to consider installing a new storage water heater around the 9-10 year mark (if its working well), and 17-18 year mark for a tankless model. 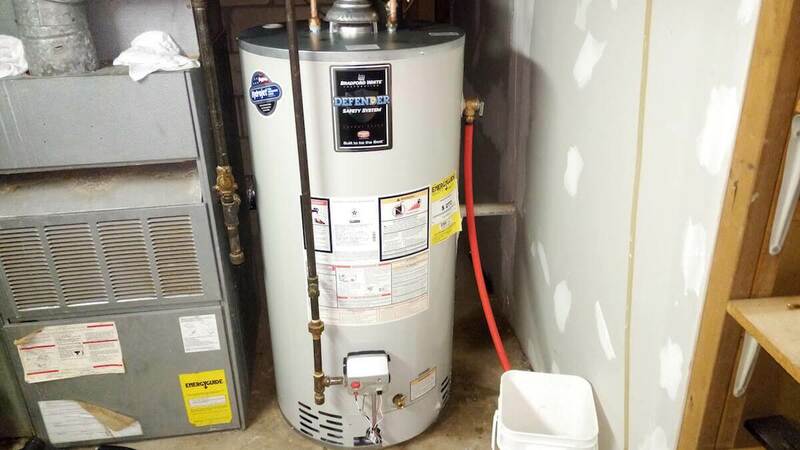 Lastly, if you just bought a new house, and found out that there is an old hot water heater, its best to just replace it, because you don't know what kind of trouble it may give you, when you least expect it. Basically, most people have a 40 or 50 gallon tank water heater in their homes. If so far you have not been running out of hot water on regular basis, you should not increase the tank size, and you will be wasting money on the upgrade. PRO TIP: If you have more than 2 persons in your household, it's advisable to get a 50 Gallon or bigger water tank. Otherwise, you will often find yourself running out of hot water (especially if you like taking long showers, or a bath). The cost difference is usually only around $100-150, but can save you tons of aggravation later. Moreover, you can consider choosing a water heater tank based on the manufacturer warranty period. Some manufacturers, sell the same tank and optional warranty upgrades, and some have different tanks. I will do an in-depth investigation into this, and will report separately. However, if you know for a fact that a brand you want has only a paper warranty, I would not buy the "extended" warranty, and stay with basic one. That is exactly what I did with my new Bradford White 50 gallons Gas water heater that I had installed in June 2016. Tank or Tankless - What's The Real Story? Deciding between installing a tank vs tankless water heater is a subject of many hot debates. In a nutshell, I have estimated that replacing a tank with tankless hot water heater is too expensive. You will most likely not save enough in energy costs to make the switch financially viable. Sure, most of Europe is using tankless water heaters, and my guess is that in Europe it is just much cheaper to install them. Most likely, plumbers in US just charge a "luxury" fee of $1,000-1,500 for a tankless hot water heater install. Because really, it's not much more work to do, compared to a storage tank. The only factor that actually increases the cost of getting a tankless unit, is changing its location. For example - most gas-powered tankless water heaters require Power Venting, and cannot be vented into a chimney. As for a tankless electric water heater - you can buy a highly rated, and a very powerful (27KW) unit on Amazon for about $450. However, for it to operate properly and at full capacity, you need a dedicated 120 AMP of power. Since most single family homes have only 100 AMP service, you probably cannot install an electric tankless water heater without upgrading your service to at least 200 amps. PRO TIP: As economical as a tankless water heater is - you will likely never recoup the extra upfront costs in energy savings. 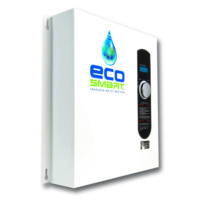 Consequently, this makes tankless models less economical in the long run. However, if you are getting a new boiler with an integrated tankless water heater - your tankless cost will be just a fraction of a standalone unit - especially that you have to do power venting any way. In fact, a boiler with a built-in tankless hot water heater is much more economical that a boiler + water heater. Another big advantage is that this is also a very fuel efficient option! Unless you do not have natural gas in your house, or have a massive solar PV array on your roof that gives you FREE electricity, you should always go for a gas water heater, because it is much cheaper to operate. A 50 gallon tank that I had installed, is "rated" $255 per year in energy costs. The same size/manufacturer electric tank is rated at over $500 per year. The supplier delivered an electric unit by mistake, and I saw the energy label on it. Think about it this way - an electric company already uses gas (in most cases) to heat up water, which then spins the turbine, which produces electricity. Why would you use that electricity to once again heat up water? It's completely redundant and you will waste tons of money! So, always go with gas if you can..
Gas is very dangerous, and that is why gas fitting licensing is so strict. I personally observed multiple gas water heater replacements, and am pretty handy myself. Yet I would not attempt doing this job myself! Potential risks are too great, and the cost of installing a new water heater is VERY low ($500-700). Also, gas requires pipes and accessories, and if you change the size of your water heater you will need to move pas pipes, which creates more potential leaks, and risk of explosion/fire. Overall, it does not make much financial sense to risk the DIY install, because many things can go wrong, and you may end up doing more damage, than saving money. Do understand - I always advocate doing remodeling yourself, but hot water heaters are just not worth it, and are potentially too dangerous. Below you can see a time-lapsed video of a licensed plumber replacing a water heater tank in my home. Keep in mind, that I would never shy away from small plumbing work, such as soldering copper pipes, etc, and if you do not want to solder or risk fire, there are great "new" push-fittings, that make connecting copper/PEX pipes super easy (see video below). However, I would not touch gas lines myself. On the other hand, an electric water heater is much easier to swap, because all you need to do is disconnect power (switch off the circuit breaker) and connect the wires. So, if you want to replace an electric unit, and are not afraid of soldering copper pipes, I don't see a problem with it.